HITS » The Inagural HITS Indoor Championship is a Success! 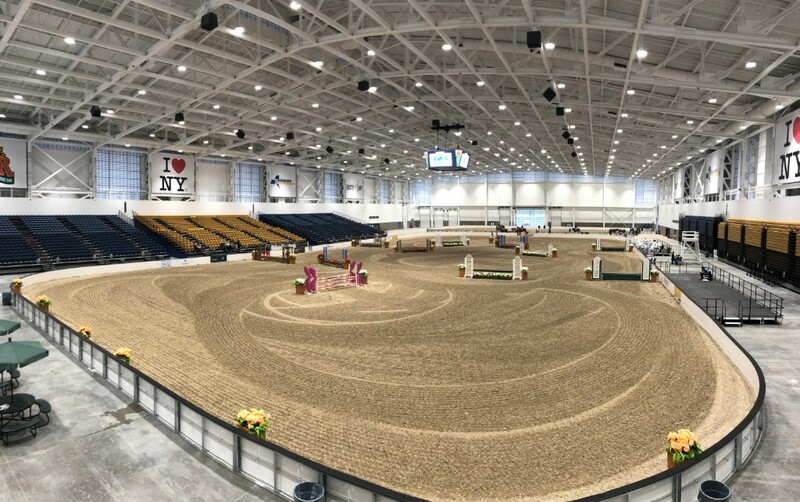 That was the chorus heard across the grounds at the Great New York State Fair Expo Center this weekend as the first annual HITS Indoor Championship inaugurated the opening of the state-of-the-art Expo Center as a horse show facility. With classes offered for Hunters, Jumpers, and Equitation ranging from 2' to 3'6", there was something for everyone. 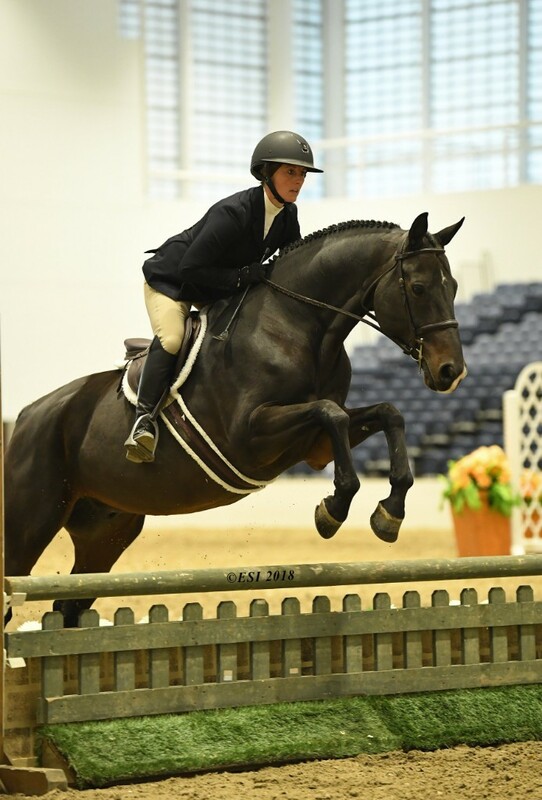 Both local and out-of-state riders and trainers joined us with great support and astoundingly positive reviews for HITS' first horse show in Central New York. The Expo Center has an Indoor Championship feel, similar to the traditional "Indoor" shows, but with a small town ambience. "I think this is a great show for kids and adults in our area. Looking at the big picture, this could bring something back, similar to the Syracuse Invitational, and that would be amazing." Division Champions and Classic winners were presented with beautiful awards throughout the week, starting with the HITS Hunters. 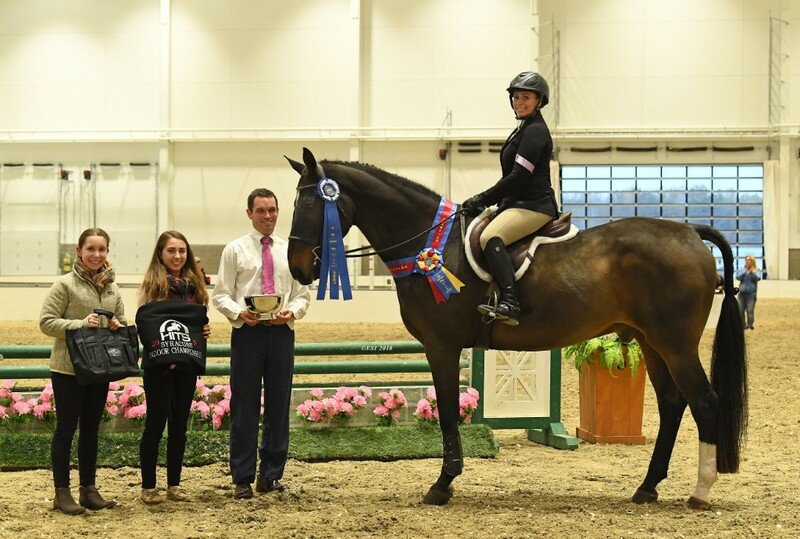 Michele Goodrich had the honor of being the first Champion crowned in the Expo Center in the HITS Working Hunter 2'6" Professional Division aboard DUNDEE. "It was truly a fun show! We can't wait to come back next year. "she said. "I'll have more horses here next year. It was an easy drive for us [from Connecticut] and the ring was beautiful. We had such a good time." RAINBOW'S END and Kathleen Krazinski were awarded champion in the HITS Working Hunter 2'6" Non-Pro Division and Jacquelyn Wadsworth took Champion in the Adequan Working Hunter aboard GAME CHANGER. Both riders train with Mark Frohm of Pittsfield, New York. "From the footing to the lighting to the jumps, everything was perfect." said Frohm. 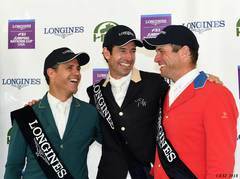 "I hope to see more national and international events held here now that we have the venue. The show was very well run and very accommodating. We had a great time." In the Children's/Adult Jumper Division, Corryn Schenkel and PIACO T, owned by Deana Schenkel, took the Championship after two days of competition. Corryn trains with Andy Kocher of Chester, New York, but was here with her sister Deana this week, who raved, "I now have a new favorite show to look forward to every year! The footing, courses, staff, and venue were all amazing! This is a show you don't want to miss next year." In the Modified Children's/Adult Jumper Division, Elizabeth Rotariu took Champion aboard MAXIMUS, under trainer Nicolle Madonna Cerio. "Not a detail was overlooked or out of place." commented Madonna Cerio. "I’ve said it before and I’ll keep saying it, Syracuse needs this. It’s exciting, it’s motivating and it’s going to change the horse community up here for the better. We are so excited for the future here in Syracuse." Jill Mulcahey took the win in the Bit O' Straw Hunter Classic aboard DA'NICO with a combined score of 163 after two beautiful rounds. Second was Katelyn Rezac and EASY LIVING with a combined score of 157. Krazinski was third aboard RAINBOW'S END with a combined score of 138. Fourth was Elizabeth Cooley and PAISLEY PARK with a combined score of 118 and fifth was Caroline Clemson and OUTSIDER with a combined score of 113. Mulcahey took the win again in the Novice Children's/Adult Hunter Classic aboard DA'NICO with a score of 79. Clemson was second with OUTSIDER and a score of 77 and third was Cooley and PAISLEY PARK with a score of 73. Elise Heim was fourth aboard COPENHAGEN with a score of 72 and Rezac rounded out the top five with EASY LIVING and a score of 47. HITS Working Hunter 2'6" Non-Pro division. Check out our full list of Champions Below! Elite Equine Child/Adult 2'6" Medal Championship. Equitation classes began with the Elite Equine Children's/Adult 2'6" Medal Championship, sponsored by Elite Equine Veterinary and Dr. John Cooley. "I loved this facility and definitely want to be here for this show next year." said Cooley. Jill Mulcahey and DA'NICO took the win with a score of an 82. Second was Katelyn Rezac and EASY LIVING with a score of 72 and third was Caroline Clemson aboard HOLLY GO LIGHTLY with a score of 71. On Saturday, Heather Knox-Fenske took the win in the Adult Medal Championship aboard SACRAMENTO with a score of 77, while Elizabeth Kenny and GOOD LUCK finished second with a score of 70. Sunday brought two more Medal Championships beginning with the Children's Medal Championship. Zoe Santilli took the win aboard DUNDEE with a score of 72 and Megan Conway was only a point behind, placing second aboard QUALEN'S BALLY WYCK with a score of 71. 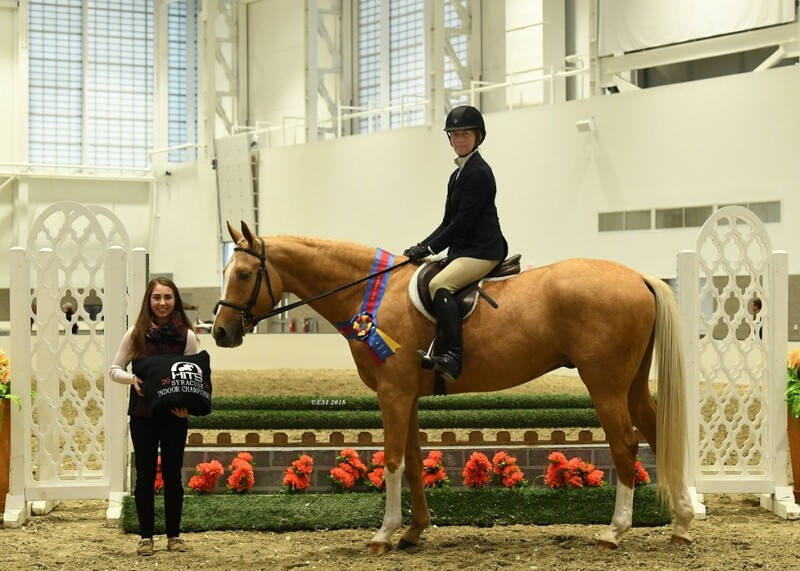 Wrapping up the HITS Indoor Championship, Bridget Vieau and and ROOSEVELT took first place in the Junior/Amateur Horsemanship Championship with a score of 78. Elizabeth Kenny and GOOD LUCK took second place with a score of 73. After much the success, HITS is looking forward to hosting this show again next year. "We couldn't be happier with how things went right from the start." said Tom Struzzieri, President and CEO of HITS, inc. "we knew once everyone got here they'd be really impressed with the facility, but it was even more than we expected." The overflowing comments and compliments continued throughout the week. "This show is incredibly exciting and exactly what this area needs." said Agatha D'Ambra, Grand Prix Rider from Upstate New York. "We don't have a lot of indoor venues so I think this could be very beneficial to the area. HITS pulled it off incredibly well and we had a great weekend from the moment we stepped off of the trailer. The ring is spectacular and fun to show in and the prizes were amazing. I would love to add this show to my calendar every year. The footing was phenomenal and horses moved well on it. Everyone was helpful and welcoming on both the HITS and the State Fair sides. The show ran smoothly with no issues with the organization and expertise you see at all HITS shows. I'm looking forward to coming back and seeing the show grow in the future." HITS is off to Thermal, California next for the National Sunshine Series, but plans are already underway for the HITS Indoor Championship 2019. Stay up to date with all of the HITS happenings by following our social media pages or visit us at www.hitsshows.com. HITS Working Hunter 2'6" Professional Division.